Can I ask a simple question to all Krystal owners ? Did you receive any written instruction from Linn about what you cannot clean you stylus with ? I sent an email to LYRA's UK distributor regarding this and have just had their reply, which I have quoted for reference. I have already had communications with Linn regarding this issue. The issue seems to be that the Linn Krystal cartridge cannot be used with ANY LIQUID STYLUS CLEANER, and that this does not have anything to do with our product Lyra SPT (which we have not recommended to be used with any Linn products in particular). Lyra SPT consists of purified, distilled, deionized water and less than 2% organic surfactants, and can be characterized as “organic soap”. Over 20 years of production we have never ever received any complaint over the use of this product for stylus cleaning, and we have been of the belief that our liquid cannot damage any stylus/cantilever (any more than soap and water would). However, it is up to Linn and their subcontracting manufacturer of Linn Krystal to decide whether their product is suitable to be used with ANY LIQUID CLEANER (not limited to Lyra SPT). 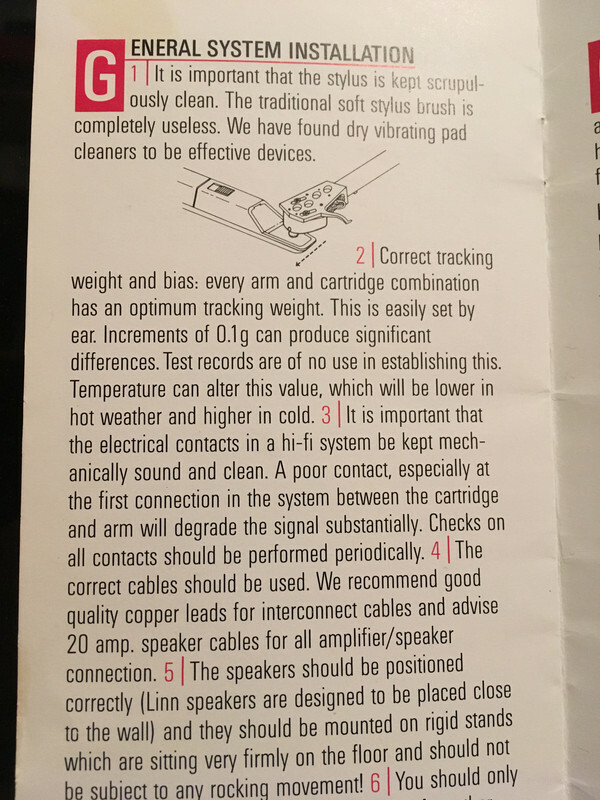 In light of the write-ups at Linn Forum, and our follow-up communication with Linn Product staff, we have decided to alter our user manual for Lyra SPT to add that it should not be used with phono cartridges that the manufacturer makes it clear that they should not be used with liquid cleaners. We will also add this to our web-site under SPT explanations. Obviously the SPT already in circulation will not yet have updated manuals. In order to make it perfectly clear, what Linn Products and their subcontractor for Linn Krystal is saying is that you should not clean the stylus with ANY LIQUID, including tap water. I hope this helps, and I thank you for your information and cooperation. Thanks for posting Kaptain clearly after 20 years without a problem why should just 2 fail in this way ??? despite having used the green paper,AT vibrating pad,and stylus fluid without any problem on 3 asakas and 2 troikas in the past. Please can you send me specific instructions on how to do this because as far I can see no information is available on how to do this safely on your website or your manufacturer, Goldrings website. Please see http://forums.linn.co.uk/bb/showthread. ... #pid458514 We would recommend the use of green stylus paper or a dry vibrating pad such as the one you have. The method of cleaning the stylus can be found below. Do not blow dust off the stylus as this can blow dirt and moisture inside the mechanism and clog up the coils. a. Linn ‘green paper’. Cut in strips approx. 20 mm x 40 mm and support at one end only while drawing in tracking direction (back towards front) across stylus tip. This method will clean and polish the stylus tip. b. Ultrasonic stylus cleaner. Use dry, and keep liquid supplied to clean the pad only. This method will clean the complete diamond, if used periodically for 3 - 5 minute sessions. I clicked the link they included and was dissapointed to see they've closed the thread on their own forum so no right of reply or more information about faults can be discussed. The announcement itself has more holes than a Tea bag. This would indicate that the investigation has been concluded. I know that Mr Fixit will provide the green paper but how do I get the free ultrasonic stylus cleaner?